The KM780 RGB keyboard can be easily paired with the MX780 gaming mouse thanks to the unified software which permits easy switching between the two for easy configuration. 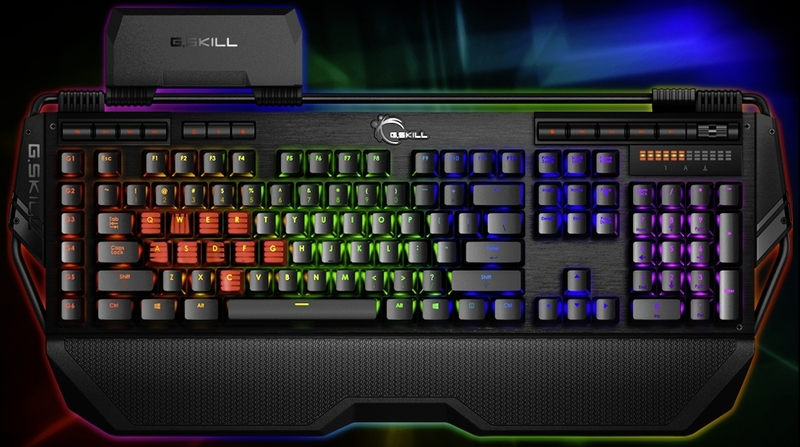 The new keyboard from G.SKILL employs one of the most recent switches from Cherry, the MX Brown RGB which permits a more uniform lighting across the keyboard thanks to the semi-transparent housing and we also get the quality and durability of the well-known brand. While other manufacturers have decided to include all extra functions along with the F-keys, G.SKILL saw fit to use separate buttons on top, for an easier access. As with other high-end keyboards, we do get a brushed aluminum top cover and as a novelty item the manufacturer has also used a steel bar around the chassis, which can be used for attaching the accessory box or for working with the cable router. At first we would like to thank G.SKILL for offering us a sample of their RIPJAWS KM780 RGB Mechanical Gaming Keyboard for testing and reviewing.